Oksana Grishuk was born on March 17th 1972 in Odessa,Ukraine. Sport has always been a major part of Oksana's life. When she was only two years old she saw a ballet performance and she wanted to do ballet herself and asked her mum and grandmother to help her. At the age of four she started to skate at the rink at the City Park under Coach Valentina Kasjanowa. Oksana started out as a single skater. Very soon it was obvious that Oksana was a major talent and when she was ten years old she got invited to skate at Brejnev's homeland Dnjeprodserschink at his birthday jubilee. Bresjnev( the leader of the USSR) was so impressed by her that he asked for another performance, but only one performance was prepared, so Oksana had to improvise. This improvisation was even better than her first performance. This meant the start of Oksana successful career. Oksana was invited to Moscow, the political, cultural and sport centre of Russia. She and her mum moved there, because the facilities were much better. She started to train at Sportclub Dynamo under Coach Elena Alexandrova. Natalia Linichuk and Gennady Karpanossov, 1980 Olympic Gold medalists Ice dance, trained at the same rink. When they turned to coaching they asked Pasha to come and train under their guidance. This was a major happening in Oksana's life, but also a difficult one, because she would not only have to change coaches but also from ladies single skating to ice dance. 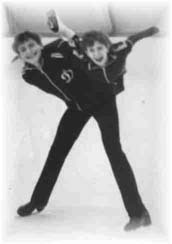 Her first partner was Alexandr (Sasha) Tchichkov, with whom she won the silver medal at the Junior World Championships in 1987( Kitchener) and the Junior World title in 1988 at the Junior World Championships in Brisbane(Australia). After this Sasha had some health problems and couldn't train very intensely anymore. Natalia Linichuk, who noticed that, started to pay more attention to her other couples. That's when Oksana teamed up ( September 1989) with Evgeny Platov. Evgeny was a member of the Army Club and was skating with Coach Natalia Dubova. He couldn't change clubs at that time, so Oksana started to skate with him under coach Natalia Dubova. At their first mutual World Championships in 1990 (Halifax, Canada) they immediately became fifth, which is something extraordinary for a new couple. Everyone knew that they had bright future ahead of them. In 1992 Oksana went back, this time with Evgeny, to train under Coaches Natalia Linichuk and Gennady Karpanossov under whose guidance they became the 1994 Olympic Champions. They were unbeatable and won every competition they entered. In 1997 they left Natalia Linichuk and Gennady Karpanossov ( Tatiana Tarassova and Elena Chaykowskaya became their advisors). In 1998 they made history by becoming the first two times Olympic gold medalists Ice dance. During the season 1997/1998 Oksana took the pseudonym Pasha, because she thought that name reflected her better and people would remember this name better. Pasha was the name of Pasha's great grand- mother. Pasha is a very familiar name in Russia; it's short for Proskovia. Pasha hasn't changed her name officially, but her fans have easily adopted this name. In the summer of 1998 Pasha and Evgeny split up. Pasha teamed up with Alexandr Zhulin, but after a couple of months she decided to set a new challenge by starting a single skating career. March 1st will remain in the memories of Pasha's fans as the date their favorite skater turned to single skating after a glorious career as an ice dancer. She wants to give single skating a new fresh look by using her ice dance skills. She won't do all kinds of triples, but is planning to have a triple salchow in her repertoire. She currently trains under the guidance of the famous skater Vladimir Kovaljov. Besides single skating Pasha also takes acting lessons but mainly to improve her expression on the ice and she coaches young skaters at her rink in Los Angeles. She had her singles debut March 1st 2000 at a show called Medallists on Ice in Boise, Idaho. Pasha plans to skate for at least five more years. Skating is like breathing to her and her heart is simply on the ice and it will always be there. All pictures are © Anushka unless otherwise noted. Please do not republish without permission of the webmaster. is a knee brace covered?